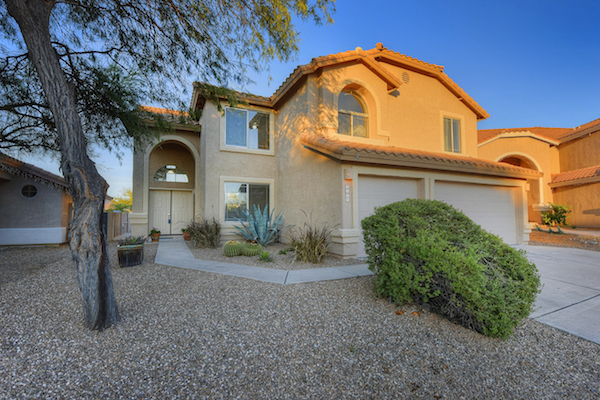 Located on a quiet cul-de-sac in the renowned master-planned community of Rancho Vistoso in Oro Valley, this spacious 2,838 square foot home offers a beautiful, clean slate to create your dream home! With 4 bedrooms plus a den, and 3 bathrooms, this impeccable, attractively updated home is ready for settling right in, with neutral finishes found throughout, including new carpet, fresh paint, and updated bathrooms and fixtures. Or for those buyers looking to add their own unique style and personal touch, it is the perfect blank canvas! Upon entering the home through a double-front door, be prepared to appreciate the abundance of natural light found in the welcoming living room! Immediately take in a picturesque view of the backyard through a gorgeous feature of amazing windows. Your eye will also be drawn to the handsome central staircase which unifies the flow of the floorplan, offering definition and interest to the living spaces. As you walk through the bright and airy entry of the home, you’ll make your way into the family room and kitchen areas – perfect spaces for family gatherings and entertaining! The open kitchen offers an island and ample storage and workspace. Buyers are sure to appreciate the luxurious finish of quartz countertops, brand new stainless steel appliances, and great lighting. The spaces flow easily together with a dining nook located between the kitchen and family room, and large windows offer plenty of natural light. The large family room features ceramic tile and a gas fireplace with tile-surround, highlighted by beautiful built-in shelving niches. The main level of the home also includes a large laundry room with utility sink, and a den perfect for use as an office, a craft room, a playroom, a studio, or whatever best suits your needs! Upstairs, you’ll find four bedrooms, each with new carpet and fresh paint. 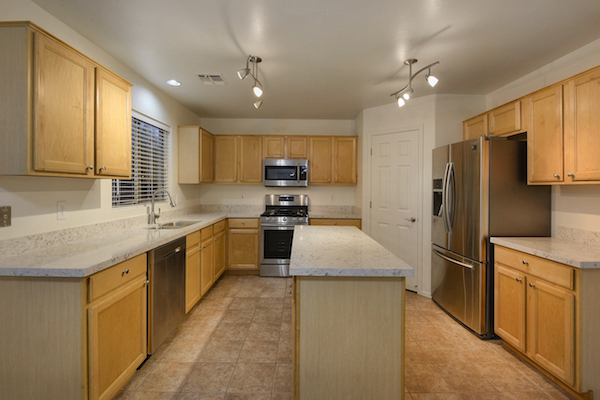 Additionally, each of the home’s three bathrooms have been updated, including new fixtures and quartz countertops. Relax in the generously-sized owner’s suite with ensuite bath featuring a walk-in closet, bathtub and shower, and a dual-vanity finished with new fixtures and quartz counters, along with new wood-look ceramic tile flooring for an updated look. 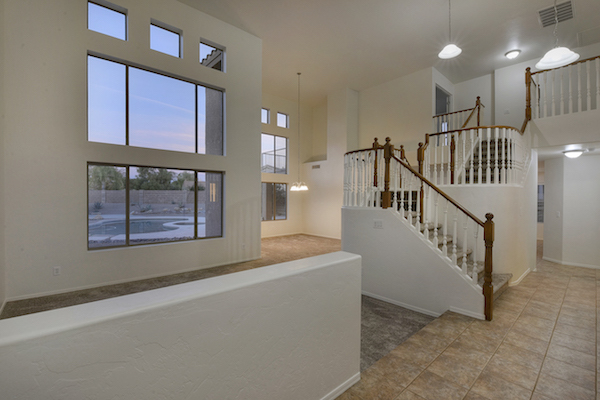 A large private balcony off of the owner’s suite offers gorgeous mountain views and overlooks the beautiful backyard – which is sure to become one of your favorite features of this home! 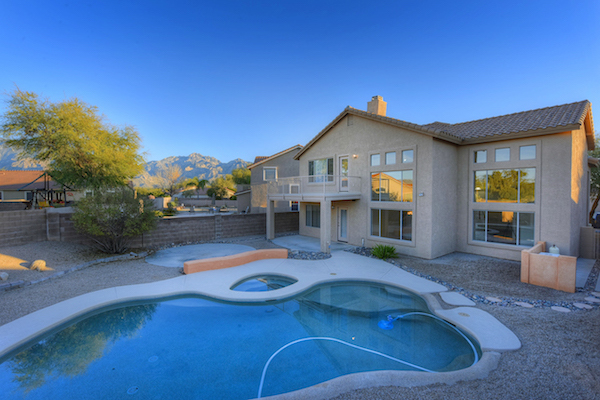 The beautiful PebbleTec pool and spa are the central feature, but the views of the Catalina Mountains and the size of this backyard are not to be overlooked! Situated on an oversized lot, there is plenty of room for entertaining and more in this outstanding yard. A covered patio and three additional seating areas are perfect outdoor living spaces. Mature citrus trees and well- tended, easy-care desert landscaping create a lovely backdrop for all the possibilities this yard has to offer! Although this gorgeous backyard oasis is an amazing retreat, you’ll also appreciate all that living in Rancho Vistoso has to offer! The open spaces of Rancho Vistoso take full advantage of the beauty and tranquility of the Sonoran high desert, offering an exceptional residential community in Oro Valley. park surrounded by natural desert. 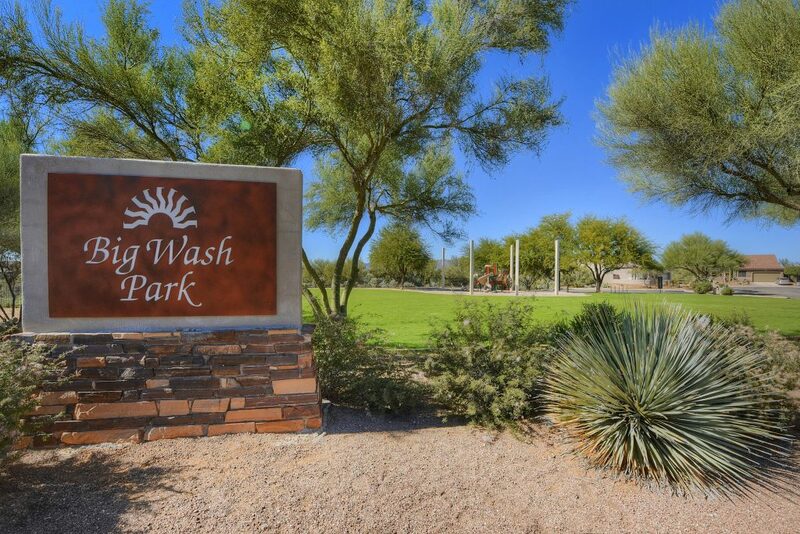 Several more community parks are located nearby, including the popular Wildlife Ridge Park, scenic Hohokam Park, and the Woodshade Linear Trail located off of Rancho Vistoso Boulevard. Also close by are Honey Bee Canyon Park and Catalina State Park, both popular Oro Valley destinations offering beautiful, easily accessible hiking trails and great opportunities for spotting desert birds and wildlife. This great Oro Valley location offers convenient access to dining, shopping, entertainment, world class golf, hiking, Oro Valley Hospital, medical facilities, and so much more! Outstanding local entertainment can be found at the Gaslight Music Hall of Oro Valley located just down the street, and Oro Valley Hospital and Oro Valley’s Innovation Corporate Center are just minutes away. Also nearby is Oro Valley Market Place, featuring shopping, dining, and a movie theater. This home offers a great opportunity to create the home of your dreams in the remarkable town of Oro Valley. An impeccable home, beautiful surroundings, quality conveniences, and an outstanding location!